On Saturday, February 9th, four staff and their families volunteered at Feed My Starving Children in Aurora. 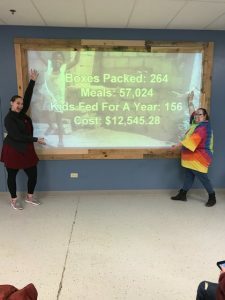 A huge shout out to Ms. Vera and family, Mrs. Kent, Ms. Ruby and family and Mrs. Kmiec for helping to feed starving children around the world. During the session, all volunteers helped pack 264 boxes of foods or 57, 024 meals. That’s enough to feed 156 kids for an entire year! Way to spread joy with your hard work and time!